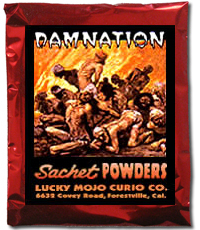 Damnation Powder is an old hoodoo spiritual supply used in spells of cursing or crossing people; it calls upon Biblical ideas of damnation, as judged by God, for wrongs that have been done. Coffee Dust is not something used in hoodoo. Perhaps your message suffered from "autocorrect symptom" and you meant Goofer Dust? If so, Goofer Dust is an old hoodoo formula that is intended to kill or disable someone (distinctively different from condemning the person to Hell). The name comes from an old African term in the K-Kongo language and means "corpse duct" or "killing dust."